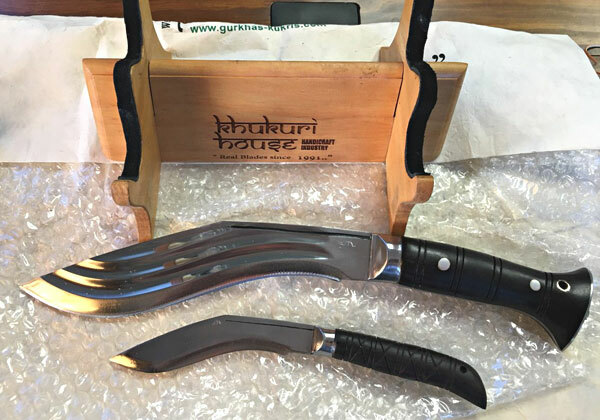 This section include Testimonials, Feedback and Reviews of Khukuri House, KHHI .Genuine Review of Khukuri / kukri knife by knife experts and ex-Gurkhas. 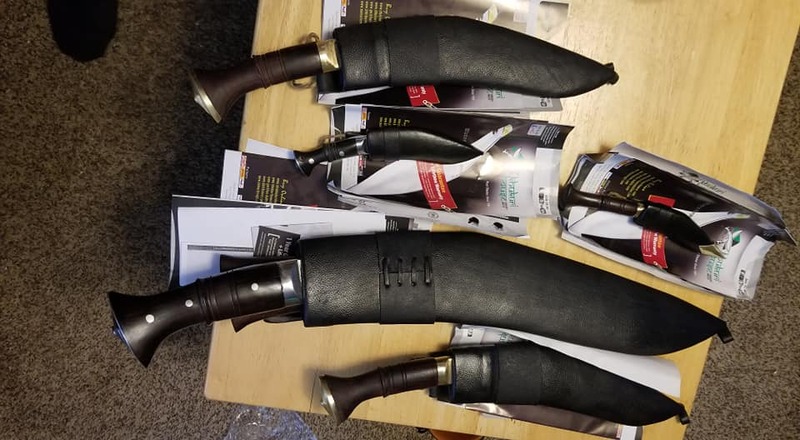 KHHI custom kukri review by kukri experts, khukri collectors and Gurkhas Army on our kukri knives. Please dont forget to send us your sweet and sour words, which will always be a motivation for us. Do email us back. We will make them count. I Love It. I wanted this to be able to use when I work and camp and it has done an excellent job. I have hacked away at some Oak trees that grow native in Oklahoma and I have not even noticed a slight ding in the blade edge. I bet this could cut a railroad track! The only thing I wasn’t impressed with is the saw back on the spine I asked for not wasn’t what I was expecting but now that I see it I wish I had just not asked because it was not needed. I also spent some time on your website after I received my knife and I was disappointed that I did not educate myself on some of the features you do provide. Much like the cross hatching for a non-slip surface where your thumb rests and getting an upgraded frog so that I can wear it on my belt at different angles. Firstly, I would like to thank you for the order. I am very happy with the quality of the knives and would certainly order for yourselves again. Thank you very much, I really appreciate the workmanship and attention to detail you have with regards to making daggers. I’ve been reading about kukris in general and watching video reviews. As you know, I own many of your products; and I want to say that each one is special. There seem to be two classes of people buying kukris – those who are traditional and those who are not. I am not traditional; but I do spend a lot of time deciding on what type of blade will best suit my needs based on design and usability. The only blade I have ordered from you that may be somewhat outlandish is the heavy bowie; and I bought two of them. I will admit that many designs are not what I personally would find useful. But that is simply my preference. Everyone is different. On the other hand, some folks have given your company a bad name. They say you cater to the western tourist mentality. While some of your designs may do that, it is up to the buyer to decide what appeals to him. There are thousands of knife makers in the world today; and most of the designs being produced seem to be expensive works of art that are not suitable for everyday use or else they are worthless junk. I have knives from all parts of the world. Some are expensive and some are not. But each knife is something that is well designed and useful and well-made regardless of how much it cost. Every knife I’ve gotten from you is a treasure; and I just wanted to let you know how much I appreciate them. A letter opener, 4" knife, a pair of 10 inchers, and a really massive 16 incher. I should have checked the weight better on the big one, lol. Its a bit much, but all are sharp and beautiful. Hopefully i can chop some things this weekend, that'll be fun. Thanks to all the fine craftsmen at khhi for this beautiful bundle of happiness. Really pleased and happy. Blessings and Namaste to you Saroj. I just received the knives in the mail (sooner than expected!) and first want to thank you and your craftsman Rajkumar for creating two beautiful pieces. Overall I am incredibly happy with the service, and the quality of craftsmanship is remarkable. THANK YOU!! I do have a question and also need to bring your attention to a couple (very small) inconsistencies from what I ordered. My question is about the chiseling on the 3 Chirra: It appears that only half of the tip was chiseled. Is this common practice or was this a mistake? Second, the Biltong 5160 was supposed to have a chiseled tip and zimping on the spine, which it did not come with. Third, I had ordered the stand in black but it came in a natural color. As I mentioned these are all rather minor issues, but do differ from my order, so I felt obligated to reach out to you about them. Overall I am incredibly happy, and honored to have these beautiful pieces from your artisan and company. I just received and unboxed this beaut from KHHI! It's their repro of the Classic MK military Ankhola! 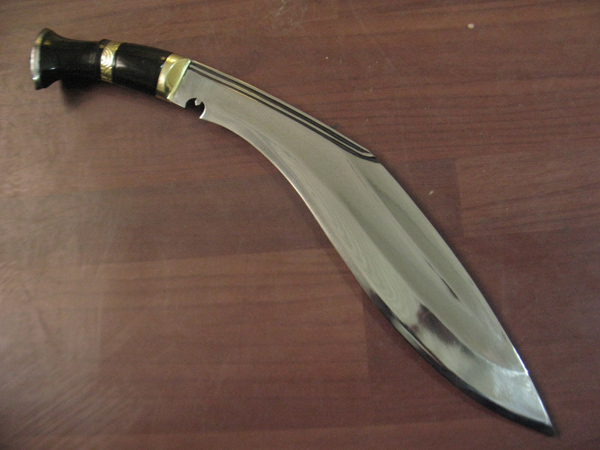 This khukri is superb! Fabulous balance in hand, very tough but light and fast and cuts like a razor! A specially made small edition with dui chirra. Fabulously crafted by KHHI! THANKS GUYS! As to feedback on your services;I found your service excellent! Your products are fantastic and have great value for money with outstanding workmanship and attention to detail producing tough, sharp well balanced knives of the highest order!. Shipping delivery went off without a problem and I received my order within 5 days of purchase! 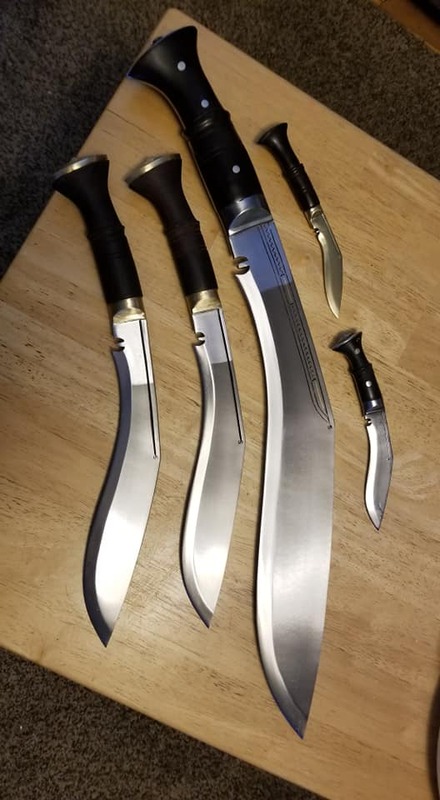 I would recommend KHHI Nepal to anyone who wants to purchase an original well made Khukuri albeit traditional, military or special custom order. 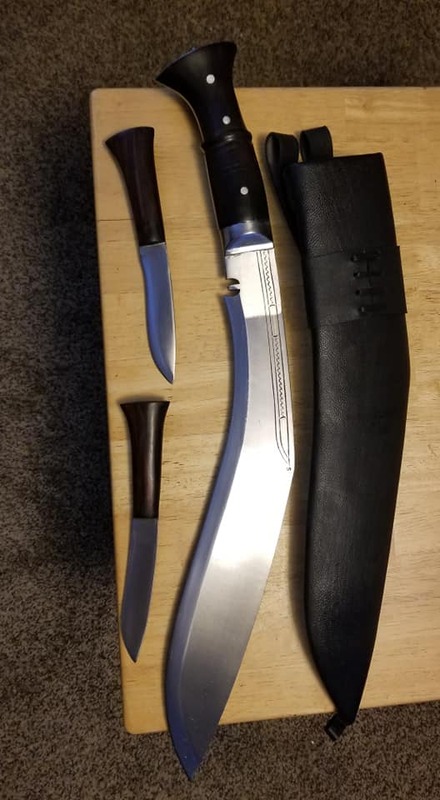 I received the Hmong knife Thursday. I want you to know I am very pleased! It is just what I wanted. Thank you for collaborating on this project and for shipping so quickly! The knife came to my door 2 days after leaving Kathmandu! Thank you, again. I received my knife today and just wanted to email you guys and tell you what a fantastic job Ajay did on the knife. I absolutely love it, the Kydex is a little tight getting the knife out, but I’m sure it’ll break in with use. Thank you guys so much for your patience, your guys do fantastic work, and I will be ordering from you and Ajay In the future. Today I received the package from you with the 2 kukri knives and 1 stand. What can I say? They are EXTREMELY WELL MADE and LOOK ABSOLUTELY BEAUTIFUL!!! You said I would like them and it is true! They actually look much better than I thought. The stand is also nice and elegant. My Gurkhe is exactly what I requested and even more than I hoped for. The Jungle Panawal for my cousin (the Afghanistan veteran) is also great! He will certainly like it very much. I can't wait to give him this gift for his birthday. 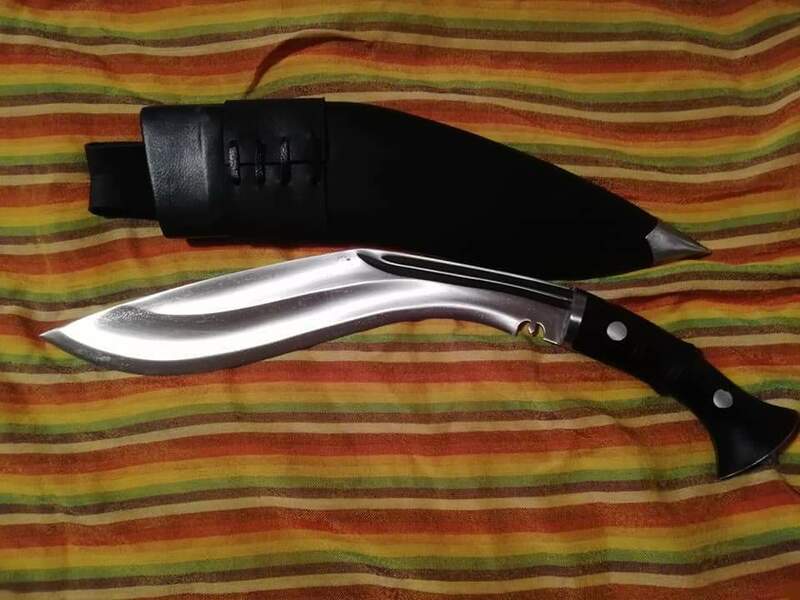 I have already two other kukri knives from you that I ordered back in 2014, one for me and the other was a present to my son. They are also very good items. Saroj, you at the Khukuri House are doing a very good and serious business. From the quality of your products, customers can see and feel that you work hard for these products. It's not basic artisanal handicraft for tourists, your items are real stuff! Saroj, when you have the time (but there is no hurry), we can start thinking about the Military Budhume project that we discussed about earlier. The package has arrived. The knife is really fine. Weight is perfect as i can swing it as normally as any other kukri. 1200gms is the strong point for me as of now.